Bodog.com was siezed by the US goverment on black friday. They do no longer allow US Players. Bodog Poker is owned by the Bodog Group and headquartered in Antigua. The servers are in Kahnawake, Canada. Bodog does not block players from the United States. Bodog is an independent poker room. It is not a part of any poker network. At the time of writing, Bodog is #3 on PokerScout’s list of the poker rooms and poker network with the most traffic to their cash game tables. Only PokerStars and 888 Poker has more traffic to cash game than Bodog. This, in combination with the ability to play against U.S. players, makes Bodog a very appealing choice for online poker players. 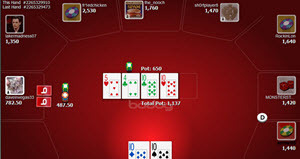 Examples of poker variants on offer are Texas Hold’em, Omaha and Five Card Stud. Bodog uses high-quality proprietary software. Since they are not a part of any poker network, they have full control over the software used and can tailor it to suit the Bodog members. .
You get a 110% bonus on your first deposit to Bodog Poker, up to a maximum of $1100. There is a loyalty scheme where you earn points by playing poker for real money. When you start playing for real money at Bodog Poker, you get 50 points for free as welcome gift. Bodog’s loyalty points can be converted into bonus money; the standard exchange rate is 100 points for $1. The Bodog Poker support is staffed around the clock, seven days a week. You can use the email form at the site or call one of the toll free numbers listed on the site. A comprehensive FAQ section is available. Examples of transaction methods accepted by Bodog Poker are VISA, MasterCard, Maestro, Switch, Solo, Delta, Skrill, Neteller, Click2Pay, and PaysafeCard.